For a Worker, Peasant and Indian Government! LA PAZ, JUNE 9 – Thousands of miners and peasants have moved to surround the central zone in the city of Sucre where the Bolivian Congress was scheduled to meet this morning to decide on a new president. Huge demonstrations demanding the nationalization of gas and oil resources forced unelected president Carlos Mesa to resign. Now parties from Bolivia's military dictatorships and the regime of Gonzalo Sánchez de Lozada, which massacred protesters in October 2003, are vowing to install Hormando Vaca Díez in the presidency. This hard-line senator from Santa Cruz has vowed to “impose order” in the face of the mass mobilizations that have shut down the capital and much of the country for the past weeks. His attempt to take over has been characterized as a “golpe blanco” (a “bloodless” or “constitutional” coup d’état). Meanwhile, the threat of an outright military takeover is very real. Radio reports state that up to 6,000 miners from Potosí, Oruro, Uyuni and other areas have joined with peasants from Potosí and southern Cochabamba to converge on Sucre demanding that Vaca Díez abandon his attempts to become president. 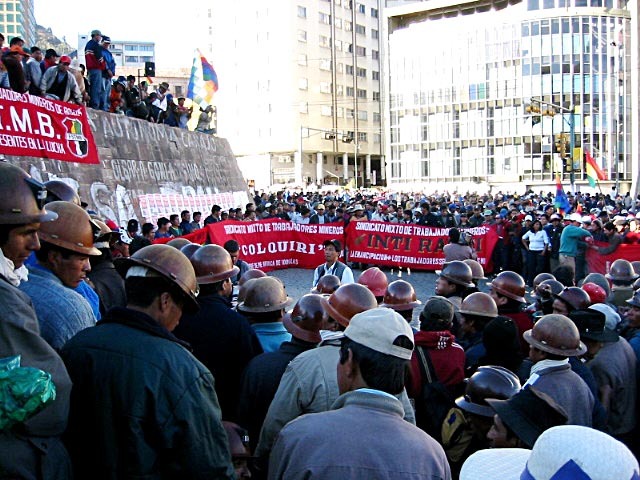 Simultaneously, the Federation of Miners Cooperatives (Fencomin) marched through El Alto, the sprawling impoverished city on the heights above La Paz, saying if Vaca Díez does not resign there will be “civil war.” Even sectors of the bourgeoisie are worried that the country could blow apart: the mayor of La Paz launched a hunger strike against the prospect of Vaca becoming president. The leader of the Movment Toward Socialism (MAS), Evo Morales, a party based on the coca-growing peasants of the Cochabamba region, is calling for the head of the supreme court to take over and call new elections. In return, Morales is offering to call off protests, knifing the miners and urban workers in the back. The call for a “popular assembly” has been a central theme of what the bourgeois press sees as the “radical” wing of the protests, sometimes counterposed to Morales’ call for a “constituent assembly.” Frequently, the demand is linked to slogans for “poder popular” (people’s power) and a “gobierno popular” or “gobierno del pueblo” (people’s government). The reference to a “people’s” assembly is a deliberate effort to distinguish such a body from a workers council such as the soviets that were the organizing center of the Russian Revolutions of 1905 and 1917. The call for a “popular assembly” means a class-collaborationist perspective, seeking an alliance with “progressive” elements of the bourgeoisie, whatever its more leftist-posing proponents may claim. And as with Salvador Allende’s Unidad Popular government in Chile, popular-frontist class collaboration spells defeat for the exploited and oppressed. 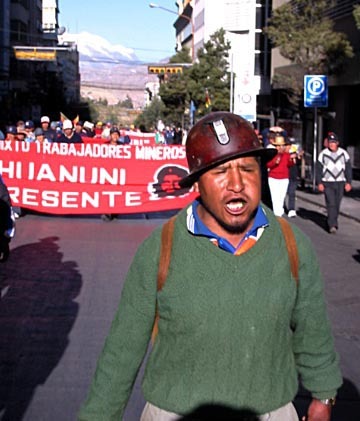 Bolivian tin miners from Huanuni march in La Paz on June 8. Yesterday morning, a meeting in El Alto formally called into being an “Asamblea Popular Nacional Originaria” (National Popular and Native People’s Assembly). The meeting was called by the Bolivian Workers Federation (COB), the FSTMB miners union, the United Bolivian Peasant Union (CSUTCB), the national street vendors union, the Regional Workers Federation (COR) of El Alto and the Federation of Neighborhood Assemblies (Fejuve) of El Alto, with delegates from 60 organizations including the La Paz provincial transport union, La Paz municipal teachers union, Public University of El Alto and others. The first resolution of the “APNO” declared El Alto to be the “general headquarters of the Bolivian Revolution,” while other resolutions described it as an “instrument of people’s power,” called for delegates to be elected in assemblies and open meetings (cabildos), and for the formation of self-defense committees and supply committees in every sector. Opportunist leftists were quick to hail the new APNO as a “counterpower” against the capitalist state. The right-wing press went apoplectic, with a fire-and-brimstone editorial in La Razón today accusing the El Alto militants of “intimidation,” “terror,” seeking a “totalitarian regime,” being like “Hitler’s Nazism, Mussolini’s fascism,” and the like. In fact, in October 2003 El Alto was the target of a genuine reign of terror by a dictatorial regime, which the bourgeois media wholeheartedly supported. Yet the incipient Popular Assembly, as presently constituted, is far from being an organ of dual power. It was called into being in a temporary “vacuum” at the head of the government, while the capitalist state in the form of the army and police is still very much in place. For several leaders of the APNO, its proclamation was a fallback position, as in the case of COB leader Jaime Solares, who at key moments has been angling for a “civil-military” regime with “patriotic” military officers, or Fejuve leader Abel Mamani, who is seeking a national dialogue under the aegis of the Catholic church. The current Popular Assembly is essentially a leadership cartel whose future evolution is uncertain. A genuine centralizing organ of dual power, a soviet, would have to grow out of dual power bodies throughout the country, which do not presently exist. Beyond the mass mobilizations, it is necessary to form workers councils of delegates, recallable at any time, as well as peasants councils and councils of rank and file soldiers. They must institute workers control of vital factories, mines, transportation and communications facilities; act as decision-making and executive bodies under proletarian leadership rather than talk-shops for rhetorical hot air; organize self-defense groups (the core of worker and peasant militias) under the authority of the mass organizations of the working people; and undertake the distribution of food and vital supplies to the population. The battle with the bourgeoisie will not be won simply by passively digging in for an endless strike – it is necessary to undertake positive steps to establish workers power. Today, for example, with supplies of gas for cooking dwindling to zero in the capital, the impact of the El Alto strike and blockade can be intensified by carrying out distribution of gas to poor neighborhoods, clinics, etc., under strict control by commissions of the Senkata YPFB plant workers, miners and slum dwellers. Such actions will dramatically underscore the capacity of the workers to rule, in contrast to the corrupt bourgeois authorities. When this begins to happen, the way will be open to ending the present stand-off and advancing to workers revolution. The calls for a Popular Assembly hark back to the body of that name which briefly existed in mid-1971 and has since become mythologized by various opportunist currents. The “Popular Assembly” of 1971, headed by left-nationalist mine union leader Juan Lechín, in reality (despite sometime leftist declarations) supported the military-populist government of General Juan José Torres, and left the workers politically and physically disarmed in the face of the long-awaited coup of rightist general Hugo Banzer. Its leaders went on to form a “Revolutionary Anti-Imperialist Front” with (by then deposed) General Torres and other bourgeois and reformist sectors. In fact, the current calls for a popular assembly in Bolivia are formulated so as to leave the door open to just the kind of class-collaborationist “alliances” that led to bloody defeats for the Bolivian workers, peasants and Indian peoples in the past.